An island's mainland ferry link has been restored several days after a mechanical breakdown disrupted services. Bad weather had hampered repairs to Barra's MV Isle of Lewis after it developed a fault at the weekend. The vessel, which had been blocking relief services from getting in or out of Castlebay pier, was due to sail Wednesday. Local Councillor Donald Manford blamed the problem on CalMac's ageing fleet. He welcomed investment which had increased services in recent years but added: "Historic neglect of the fleet is the basic cause of the pressures being put on vessels." He said: "They are getting older and are having to work harder. "That is placing a great deal of stress on the existing services." People travelling between Barra and the mainland had faced an alternative route via Eriskay and then on to Lochboisdale. 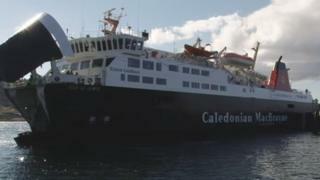 A CalMac spokesman said: "A technical failure of the MV Isle of Lewis's bow thruster engine exhaust system connection to the hull, combined with extremely adverse weather hampering our repair efforts, has caused significant disruption in the southern Outer Hebrides over the past few days. "We have worked extremely hard to keep traffic moving with emergency timetables mobilised but we appreciate some people may have been inconvenienced, for which we would like to apologise, we would also like to thank all for their patience and understanding during this period." The spokesman said the damage had led to a "small amount of water ingress" but passengers had never been at risk.